Looking for a Sophisticated Sedan in Phoenix, Arizona? 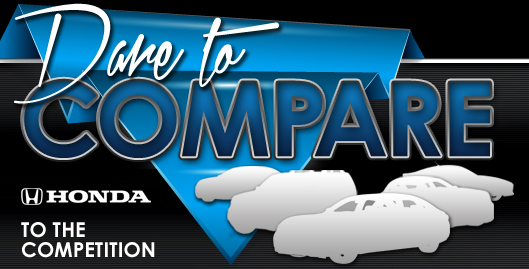 Bell Honda is proud to reintroduce one of the nation's most celebrated sedans. The 2018 Honda Accord is back in Phoenix and it showcases impeccable updates. The redesigned Accord comes with a multitude of amenities, ranging from the latest in technology to a comfortable and luxurious cabin. In addition, its new look is guaranteed to make people do a double take. Honda's engineers designed a car that's not only good looking, but also incredibly smart. The new version of the distinguished Accord provides its users with a multifaceted infotainment system that features technologies like Apple CarPlay, Android Auto and more. Continue reading below for more information, and make sure to browse new Honda Accord inventory after finishing our review. The 2018 Honda Accord in Phoenix is offered in an array of models to match the desires appropriate for the user. The six trim levels are LX, Sport, EX, EX-L, EX-L Navi and Touring. All assure that you'll receive a rearview camera, LED low-beam headlights, 17-inch alloy wheels, Bluetooth connectivity, a 7.0-inch touchscreen infotainment system with a four-speaker stereo and a USB port. 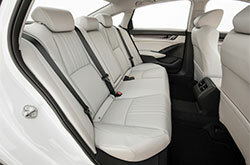 There's also an abundance of cargo space--the largest in the segment. After the base model (Accord LX), another notable model is the Accord EX trim. In addition to the above-mentioned features, it offers a moonroof, remote start, 60/40 split-folding rear seats, Apple CarPlay and Android Auto integration, a larger 8.0-inch touchscreen, heated front seats, an eight-speaker audio system and keyless entry/start. Proceeding that model is the Accord EX-L trim, which contains a power passenger seat, a 10-speaker stereo system, driver-seat memory functions, a leather-wrapped shift knob, leather upholstery and an optional navigation system. If you're looking for a trendier vehicle, we recommend the Honda Sport. This next-generation model offers 19-inch alloy wheels, paddle shifters on CVT-equipped 1.5-liter turbo-four variants, unique exhausts, aluminum pedals, a rear spoiler, LED fog lights and a leather-wrapped steering wheel. Other optional amenities include rain-sensing wipers, front and rear parking sensors, approach lights, a 6-inch head-up display, auto-dimming rearview mirror, four-way power-adjustable passenger seat, driver-seat memory function, a wireless charging pad, navigation and Wi-Fi connectivity. 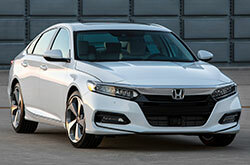 As many 2018 Honda Accord reviews note, all models are powered by the high performing new platform with the latest turbocharged 1.5-liter four-cylinder engine (192 hp, 192 pound-feet of torque) and a continuously variable automatic transmission. 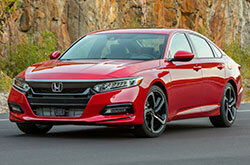 Available for the Honda Accord Sport, EX-L, EX-L Navi and Touring trims is a 10-speed automatic transmission and 2.0-liter engine with 252 hp and 273 pound-feet. If desired, the Sport can be operated by the new short-throw, six-speed manual transmission. The Accord Hybrid is remanufactured with a modernized version of Honda's two-motor hybrid system that couples a 2.0-liter to two electric motors and a lithium-ion battery for a total output of 212 hp. Offering cutting-edge security, every model now comes standard with collision warning, automatic emergency braking, lane departure warning, lane-keep assist, road departure mitigation, traffic sign recognition and adaptive cruise control. A driver attention monitor, blind-spot warning and rear cross-traffic alert are also offered on select trims. See the rest of our 2018 Honda Accord review below to find more photos, video and independent comparisons. The esteemded 2018 Honda Accord should be on your new car shopping list, especially if you've been on the lookout for the 2018 Hyundai Sonata, Toyota Camry and the Kia Optima near Phoenix. You could end up liking its excellent cabin features and rakish exterior design among other qualities. Take advantage of our review to see if the 2018 Honda Accord is right for your specific needs. Also, take a peep at current current Honda Accord financing and lease offers available at Bell Honda! 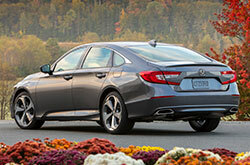 Desire a Honda Accord and looking for money-saving offers? Then make sure you visit us straightaway! We've included this 2018 Honda Accord review on our site to make it less time consuming for you to find the details and specs you need to make an informed vehicle purchase. We have a massive reserve of excellent Honda Accord models in Phoenix, AZ - drive one today. Play our video clip to take a glance at its dapper design before your visit.